Proceedings in Coleman' suit start today. MINNEAPOLIS, Minnesota (CNN) - As former Republican Sen. 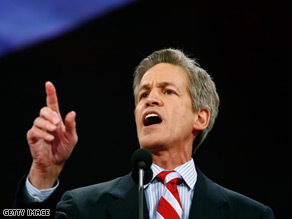 Norm Coleman's lawsuit contesting the results of a hand recount in Minnesota begins today, his lawyers are predicting a 'very, very tedious proceeding." The three-judge panel overseeing the suit will convene at 1 pm CT Monday. Coleman is contesting results that gave Democrat Al Franken the edge with 225 votes out of approximately three million ballots. On a conference call Sunday, Coleman lawyer Joe Friedberg said he expects a "very, very tedious" proceeding. Friedberg, a prominent Minnesota lawyer, will present opening arguments in the case. "It will be very boring," he said. "There's no way I think I can interject any jokes into it." Ben Ginsberg, a Coleman adviser since the recount who last week was chosen as the legal spokesman and who played a key role for Bush/Cheney in the Florida recount of 2000, admitted that in a "strictly legal sense" the burden falls on them in this case. "We are, after all, the contestant," Ginsberg said, "but I have to say that we feel little weight on our shoulders as we go forward." As previously outlined by the judges, the trial - with the exception of Monday - will follow a 9 am to 4:30 pm weekday schedule, with an hour break each day for lunch. It's possible that the proceedings could result in a second statewide recount - though the likelihood of that remains uncertain. Coleman's counsel will have to prove before the judges the irregularities and inconsistencies they are alleging. A central argument of theirs revolves around rejected absentee ballots - potentially 12,000 of them - they'd like the court to examine. They contend that 4,500 or more of these could have been rejected in error. During the recount, only about 900 of these improperly rejected absentee ballots were chosen for tabulating. Each ballot they wish to have counted may have to be declared one at a time by what Friedberg called "administrative"-style witnesses on the stand. Over the weekend Coleman's attorneys announced they would be pushing a separate class action lawsuit on behalf of the 12,000 voters whose absentee ballots were rejected. Team Coleman also maintains there may have been hundreds of votes accidentally counted twice, and a third part of their case rests on their allegation that inconsistencies in certain precincts may have led to improper vote totals during the recount, which Team Franken denies. In an interview with CNN Wednesday, Coleman called Franken’s lead “artificial,” and said once the court finishes it's business he anticipates to come out on top. It’s all because, he says, some ballots were counted twice and others never counted at all. “We have got a good shot at this and so I proceed with that in mind,” he said. Presenting their motion for summary judgment Friday, Coleman attorney Jim Langdon made a focused push over the issue of the 4,500 ballots they say were improperly rejected. They asked that the court approve their request that all rejected absentees be grouped into at least one of 36 categories they’ve come up with. One category, for example, would be for ballots that were improperly rejected due to a sticker accidentally covering a voter’s signature. They say a classification method would expedite the trial. “If you don’t group the rejected absentee ballots into categories, you in fact will have to call each individual voter and each individual election judge under their theory of the case to try and validate a ballot,” Ginsberg told reporters after the day’s proceedings. The judges offered no indication when a decision on summary judgment requests would come down. Coleman attorneys also pushed back against Team Franken’s assertions that it’s crucial Minnesota have two senators immediately. Ginsberg attempted to compare Minnesota’s situation of having only one senator to the states of Illinois and New York when both then Sens. Barack Obama and Hillary Clinton, respectively, were out on the trail campaigning. Franken, meanwhile, is pursuing his own unilateral legal action with the state's Supreme Court. In early February the court will hear arguments that Republican Gov. Tim Pawlenty and Secretary of State Mark Ritchie, a Democrat, be forced to sign an election certificate so Franken may be seated in the Senate provisionally. MN needs to get it's act together. I am a 59yr old caucasian woman who has had her life destroyed during the past 2 years due to the antics of the State of MN. First Paul Wellstone and now Jim Ramstad has left us-these 2 men truly cared about the PEOPLE of MN. I honestly don't know what kind of Senator Al Franken would be, but I do know that Norm Coleman is an arrogant, self-serving individual who has little concern for those who are poor, of color, indigent. This fiasco of a trial is a travesty and only prooves the arrogance of Coleman. Who is paying for this? Win or lose I hope he gets the bill and is ordered to PAY IN FULL prior to regaining his seat or moving on to another state to take personal advantage of. Coleman should just concede now. The re-count was very meticulous and impartial. Notice our Republican governor has no problem with the way the re-count was conducted. Coleman is just ruining any future he may have in politics by carrying on the way he is. Everyone remembers how he told Franken to concede for the good of the state when it looked like Coleman may have a narrow victory on election night. Now he looks like a hypocrite. I never liked Coleman anyway (too many dubious goings-on and too much rubber-stamping of Bush policy) so I'm happy to see him go forever which is what will happen if he keeps fighting to the detriment of the state. He will always be remembered as a whining sore loser. Go away---Senator Franken won- you lost- get over it. we need our sen. working on cleaning your republicants mess. face it NORM. 250 more people voted for change than fear. better luck next time loser. There are parallels but the main difference was that Bush's Supremes stopped the recount from going forward which has been shown to have given Al Gore (who received the popular vote by over 500K ) a lead in Florida of 10K to 15K votes. In MN we know how to recount ALL the votes and let the votes be recounted. Al Gore gave up his fight for the good of the country. Coleman, who asked Franken to do the same earlier on... has not and it appears that he will not. Interesting how Coleman is now the "whiner" when Stewart Smalley was crying on November 5, 2008, because he was behind. Liberals know no shame. Stewart is only ahead because of double-counted ballots and mysteriously appearing ballots. Way to save the taxpayers money Norm , Please just go away you LOSER !!!!!! You know, I vaguely remember, shortly after Nov. 4, Coleman saying that if he were the one that was behind he would concede for the good of the state in order to forgo the costly recount process. Where is that Coleman now? Oh right, he never actually existed; it was all an act! The Reich Wing is at it again. Complaining about Gore 8 years later. Yeah, how'd that Bush thing work out for you? ?